eCheck is a very convenient and secure way for you to make your deposits and withdrawals into and out of your online casino account. Using eChecks allows you to deposit funds into your online casino account right from your banking account and cashout so your funds are put right into your banking account. It seems almost too good to be true to have US players being able to use their banking account for online casino gambling. The process for using eCheck is very simple and one that many players will already be familiar with from using eChecks online for other things. Of course, everything starts with being registered for a player account at that casino. Then, you should make sure you take advantage of any available deposit or reload bonuses you are eligible for by entering any necessary codes during the deposit process. 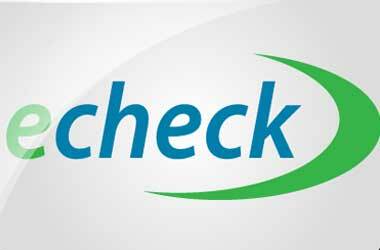 Once you choose to make your deposit or withdrawal using an eCheck, you will enter all the necessary information. Make sure you also meet any minimum requirements for the amount of deposit or withdrawal you are making. eChecks generally offer you fast transactions that don’t cost you much, if anything at all, in the way of fees.